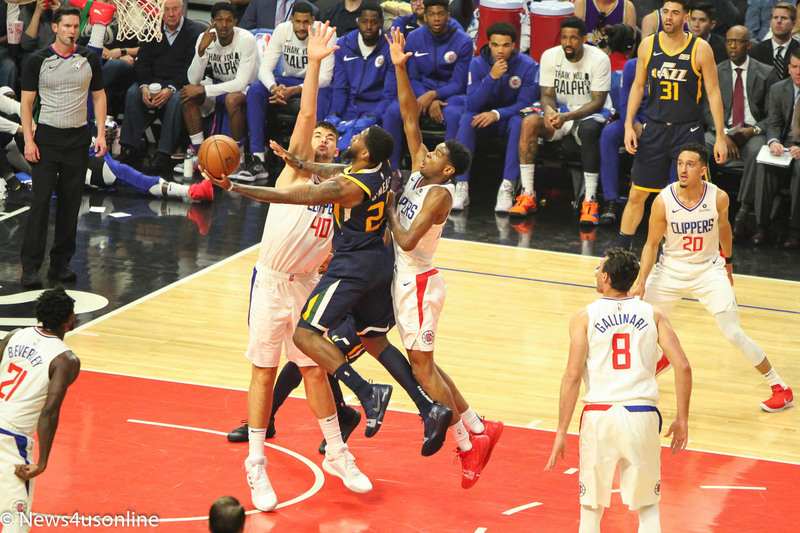 Before they dribbled once against Utah Tuesday night, the Clippers knew their playoff opponent. With Oklahoma City and San Antonio winning, a one versus eight matchup with the two-time defending champion Golden State Warriors (57-25) was locked for Los Angeles. 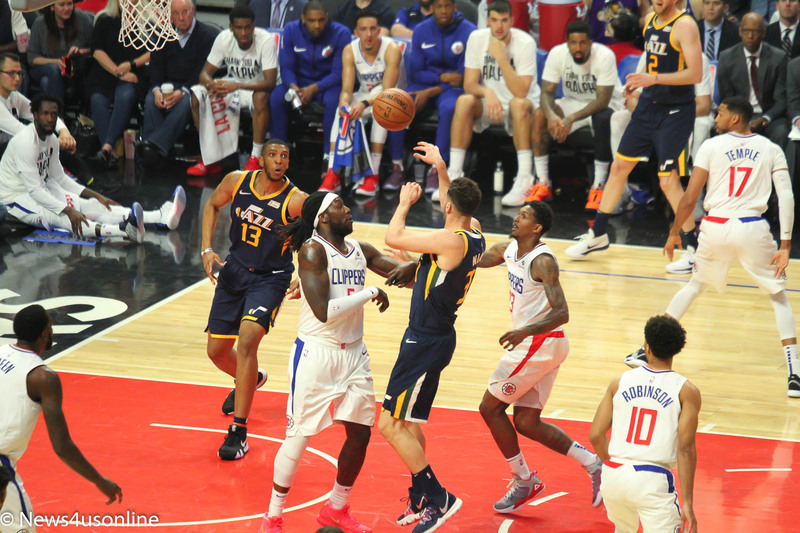 But, that didn’t stop the Clippers (48-34) from surviving the Donovan Mitchell, Rudy Gobert, Derrick Favors, Kyle Korver, Raul Neto and Ricky Rubio-less Jazz in overtime, 143-137. A night honoring 40-year legend Ralph Lawler’s final regular season broadcast allowed fans to raise scarlet signs and yell “Bingo” after each made L.A. 3. To quote the legend himself, “Oh me, Oh my” how Clipper fans lost their voices. The Clippers created 12 “Bingos,” shooting 50.9 percent from beyond the arc. 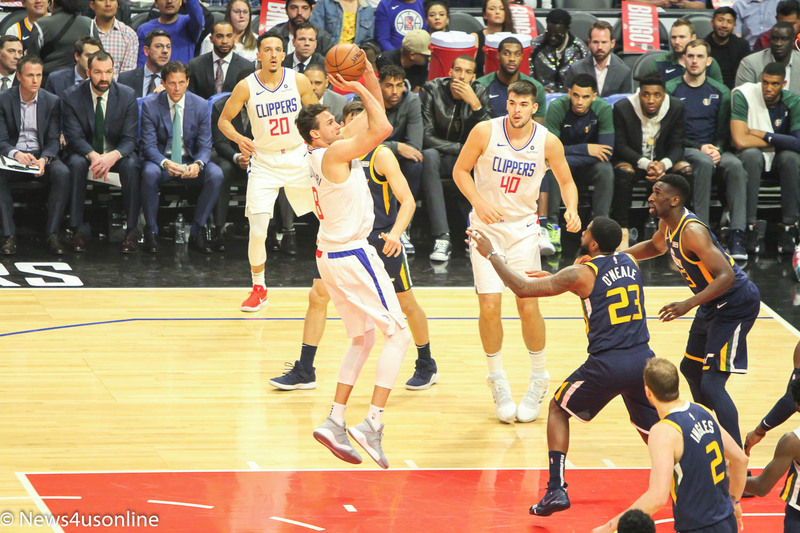 A group of Ivica Zubac, JaMychal Green, Jerome Robinson, Tyrone Wallace, and Sindarius Thornwell won the game for the Clippers down the stretch. Zubac starred with 22 points and 11 rebounds. The Clippers’ starting five of Patrick Beverley, Danilo Gallinari, Ivica Zubac, Landry Shamet, and Shai Gilgeous-Alexander, in addition to Lou Williams, played under 30 minutes. ‘We’re excited to be in the playoffs and glad to finish the regular season with a win at home before we go into the playoffs,” Clippers forward Montrezl Harrell said. First-year guard Grayson Allen poured in a game-high 40 points for Utah, doing so in 41 minutes. The Jazz (50-32) are seeded fifth and will take on the fourth-seeded Houston Rockets (53-29) in the first round. If the regular season was any indication, the Clippers don’t exactly matchup with Golden State perfectly. The Warriors won three of four against the Clippers, two of three by double digits. Golden State starts five all-NBA caliber players, while the Clippers have possibly one in Lou Williams. With that being said, there’s still room for optimism in Clipper-land. In each of the Clippers previous games against Golden State, with the exception of their 27-point loss in Oakland last Sunday, the roster looked quite different. In December and January loses to the Warriors, Tobias Harris and Marcin Gortat were featured as some of L.A.’s key pieces. In the recent 27-point loss, Gallinari was out due to a sore left ankle. For better or worse, the team is different now. Youth is much more of a theme on this iteration of the Clippers, led by two rookies (Gilgeous-Alexander and Shamet) in the starting lineup. And, most importantly, the Clippers are healthy. Still, in many ways, Golden State represents everything the Clippers are not. The Warriors are expected to win now, aiming to win four championships in five seasons. L.A. is built for future contention, with young talent and cap space to snag an elite free agent from this summer’s crop. Golden State publically struggled to stay motivated during the regular season, while the Clippers had to grind out every game en route to a 48-win season. The Warriors won four of their last five regular season games. L.A. stumbled down the stretch, losing three of five. Golden State plays off-ball movement from their stars, while Beverley and the Clippers live off playing scrappy. When the Clippers have competed with and beaten the NBA’s elite this season, they’ve done so by forcing others to play their style. It’ll be challenging for the Clippers to take Golden State out of their game, considering the firepower of Stephen Curry, Klay Thompson, and Kevin Durant, as Clippers head coach Doc Rivers alluded to Wednesday night. Roughly three hours before tip, Bill Walton introduced Lawler at midcourt for an honorary press conference. As part of his final regular season broadcast, Walton joined Lawler in the booth to narrate things, both related and not related to, hoops. During a halftime ceremony, Lawler stood beside his family and received three gifts from the Clippers organization: a scholarship in his name at his alma mater, Bradley University, a golden microphone that will stay courtside at all future Clipper games and a dream trip to Australia and New Zealand for two. Ralph Lawler is Clippers Basketball.